HAMILTON: Stand-in captain Rohit Sharma warned against complacency ahead of India’s World Cup fight yesterday after a resurgent New Zealand inflicted one of his side’s heaviest ever one-day defeats. The New Zealanders cruised to an eight-wicket win in the fourth ODI in Hamilton as the dominant form that swept India to a 3-0 series victory disappeared. The tourists were skittled for 92 with 19.1 overs to spare-their lowest total in nine years-before the Black Caps chased down the modest total to triumph at 93 for two in 14.4 overs. No opponent has ever defeated India with so many balls remaining in their innings and India has only scored as badly on six other occasions. With the series already won, captain Virat Kohli sat out the dead-rubber fixture and MS Dhoni was sidelined with a hamstring strain. Sharma took the skipper’s armband for what was supposed to be a celebration of his 200th ODI but Black Caps’ paceman Trent Boult crashed the party to take five for 21. 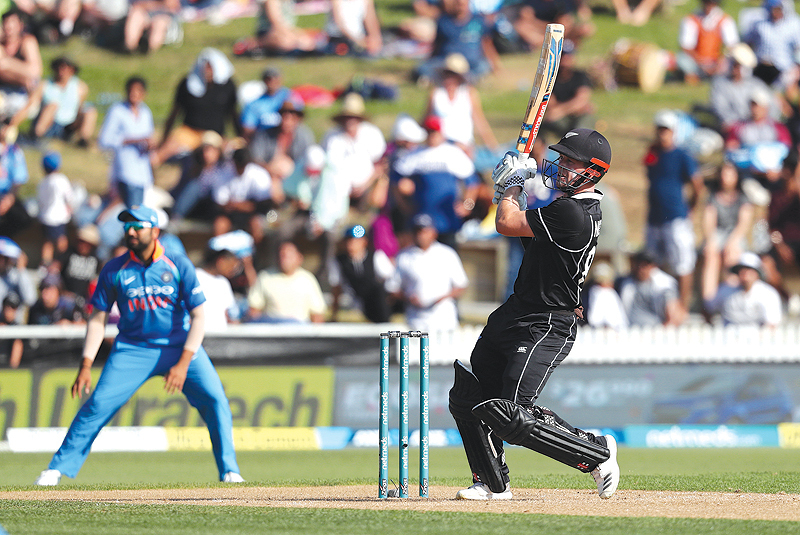 While Boult and the rest of the New Zealand attack benefitted from humid conditions that allowed them to produce swing for the first time in the series, Sharma said that was no excuse. “We never expected something like this but sometimes these games can happen,” he said. Sharma said the pitch remained “a great wicket to bat on” but his batsman had failed to apply themselves because they had already won the series. He warned such an attitude could cost the second-ranked ODI team dearly at the World Cup starting in England in May. “Just because we’ve won the series doesn’t mean we can relax,” he said. “We’ve got this big prize ahead of us and we’ve got to keep ticking the boxes. The good teams do that. While the performance will not cause India to hit the panic button ahead of the World Cup, there will be disappointment at how their batsmen fared without superstars Kohli and Dhoni. Yuzvendra Chahal top scored for the tourists with 18 much-hyped debutant Shubman Gill failed to reach double figures, falling for nine. Boult’s man-of-the-match performance resulted in the second-best ever figures for a New Zealander against India while all-rounder Colin de Grandhomme also contributed three for 26, his best ODI return. “It was good to get out there and show what we can do,” said Boult, whose third-ranked New Zealanders had been rattled by their lack of competitiveness in the opening three matches. Boult and de Grandhomme tore the heart out of India’s middle in a devastating spell that saw the tourists lose five wickets for seven runs. New Zealand dropped opening batsman Colin Munro and promoted Henry Nicholls up the order in a bid to stop a string of slow starts. The experiment worked as Nicholls made 30 not out, although fellow opener Martin Guptill’s poor run of form continued when he was dismissed on 14.